I have 92 cards of Andy Benes. This one is from 1995 Zenith. Playing career: Andy Benes was the number one overall pick in the 1988 draft. There is always a lot of pressure from being drafted in that spot, and Benes did well to have a very solid major league career, avoiding being considered a draft “bust”. In fourteen major league seasons with San Diego, Seattle, St. Louis and Arizona, he went 155-139 with a 3.97 ERA, striking out exactly 200 batters. His W-L record might have been even better if he wasn’t stuck pitching for some bad Padres teams in the early 1990s; in 1994 he led the National League in both strikeouts and losses. Where he is now: The varsity baseball and softball coach at Westminster Christian Academy in St. Louis, he is involved in a variety of community and charity endeavors. My memories: I remember when I first got his card I thought his name was pronounced "Beans". It's actually pronounced "Ben-Ess". Interesting facts: Brother of former Cardinals Alan Benes and Adam Benes, his son Drew Benes pitched for three seasons in the Cardinals organization. Google Autocomplete results: He is first when you type Andy Ben, ahead of Andy Benoit, an NFL analyst for Sports Illustrated. Another prominent Andy Benes was a 23-year-old cancer victim in Florida. Coming up next: The next profile will be Juan Beniquez. I have 25 cards of Alan Benes. This one is from 1998 Score. Playing career: Alan Benes pitched eight seasons in the major leagues, six of them with the Cardinals. He also pitched briefly for the Cubs and Rangers. In 115 games, he went 29-28 with a 4.59 ERA. My memories: I remember him as one of three Benes brothers in the Cardinals organization at the same time, for which there was a fair amount of hype. In addition to Alan and his more famous brother Andy, there was an Adam Benes who did not make the major leagues. Where he is now: A scout for the Cardinals. Google Autocomplete results: He is ninth when you type Alan Ben, between Alan Bennett The Habit of Art, referring to a playwright and play, and Alan Bendich Youtube, referring to the host of a web-TV program. Coming up next: The next profile will be Andy Benes. Kerry Taylor pitched nine years of professional baseball, including two years in the major leagues with the Padres. Now a Regional Sales Manager at Ziegler Ag Equipment in Minnesota, he kindly answered my questions about baseball cards.
" I don’t really have any interesting stories about baseball cards. The card companies kept things under control and laid out their rules very clearly after the 1989 Billy Ripken “Fu#% Face” card was published. We had to behave ourselves since they threatened to not print our cards if we didn’t. I don’t recall any particular baseball card that caught my attention over any other one. I thought it was strange that a George Bell card I had was spelled “Jorge” until I heard that is how he originally spelled his name. I didn’t pay too much attention to baseball cards while I was playing. I collected baseball cards in the early ‘80’s when I was growing up but nothing since then. I still have those cards today but haven’t looked at them for years. I remember Pete Rose, Rollie Fingers, Goose Gossage, and Dave Conception action cards being some of my favorites growing up though." I have one card of Brian Benefield, from 1999 SP Top Prospects. Playing career: Second baseman Brian Benefield played five seasons of professional baseball, mostly in the Indians organization. In 421 games he hit .253 with 34 HR and 158 RBI. Where he is now: Anyone know where Brian Benefield is now? Google Autocomplete results: He is second when you type Brian Benef, between Brian Benefiel Carthage MO and Brian Benefiel Carthage, both of which refer to a murder suspect. Another prominent Brian Benefield is Co-Director at Ma Petite Ecole in San Francisco. Coming up next: The next profile will be Alan Benes. I have 34 cards of Bruce Benedict. This one is from 1985 Fleer. Playing career: Catcher Bruce Benedict played in twelve seasons for the Braves. He was an excellent defensive catcher with a mediocre bat. He only hit over .260 in two of those seasons, but both years he was an All Star, an indication of how highly regarded a catcher he was. A fuller account of his career can be found at the 1986 Topps Blog. Where he is now: He is a Cardinals scout and also operates the Bruce Benedict Baseball Academy in Dunwoody, GA. Since his playing days he has worked as a college basketball referee in the off-season, including Division I games for the past 25 years. He most recently did Vanderbilt’s 66-55 win at Texas A&M on Saturday. My memories: I remember him as part of the lousy Braves teams that were always on TV in the late 80s. Other than the Yankees and Mets, the Braves were the only team regularly on TV (on TBS) at that time, except for a couple of years with WGBH (Red Sox) and WGN (Cubs/White Sox). Turns out he was actually pretty good, especially defensively. Interesting facts: His son Griffin Benedict played two seasons in the major leagues and is now the Padres’ bullpen catcher. Google Autocomplete results: He is first when you type Bruce Bene, ahead of Bruce Benenson, owner of Benenson Capital Partners. Another prominent Bruce Benedict is a photographer. Coming up next: The next profile will be Brian Benefield. I have two cards of Bill Bene. This one is from 1989 Topps. Playing career: Bill Bene had unimpressive numbers at UCLA, walking more batters than he struck out while pitching to a 5.62 ERA. However, the Dodgers loved his arm and thought they could teach him to pitch, drafting him number one (fifth overall pick) in the 1988 draft. The experiment did not work. He put up some pretty horrific numbers early on, most notably at Vero Beach in 1990 when he went 1-10 with a 6.99 ERA, walking 96 batters and striking out 34 in 56.2 innings. Eventually he was so wild that the Dodgers just had him pitch to teammates in batting practice; after he broke one player’s wrist with an errant fastball, they just had him pitch to a dummy, which Bene drew a mustache on and called “Harold”. To Bene’s credit, he didn’t give up, and while he never pitched in the major leagues, he put up some fairly respectable numbers. From 1991-1997 in the Dodgers, Reds and Angels organizations he went 9-16 and a 4.97 ERA. Never great, he nonetheless was able to pull himself up from “terrible” to “mediocre”. You can read more about his career at Cardboard Gods and Smed’s Baseball Card Blog. Where he is now: In 2012 he was sentenced to six months in jail and to pay over $100,000 for operating a counterfeit karaoke business and not paying federal taxes. He is now out of jail and working in telecommunications sales in Los Angeles. My memories: I remember him being a first round draft choice card, looking at his numbers and finding it hard to believe that he could be a major leaguer. Google Autocomplete results: He is third when you type Bill Bene, between Bill Benedict Alpine Meridian, referring to the CEO of a venture capital firm, and Bill Benenson, a filmmaker. There do not appear to be any other prominent Bill Benes. Coming up next: The next profile will be Bruce Benedict. Bud Smith pitched eight seasons of professional baseball, including two years in the major leagues with the St. Louis Cardinals. On September 3, 2001 he pitched a no-hitter against the San Diego Padres. Now a scout for the Toronto Blue Jays, he kindly answered my questions about baseball cards. "I was a huge card collector as a kid and still have most of them in boxes. My favorite card was by far the 1989 Upper Deck Ken Griffey Jr card. Still have it in one of the thick glass cases as if it were worth thousands. Not so much but was fun to collect. As far as collecting my own cards I didn't but my family did, kind of cool now because my 7 year old son has them all." I have fourteen cards of Johnny Bench. This one is from 1984 Fleer. Playing career: Arguably the greatest catcher of all time, Johnny Bench played seventeen seasons for the Cincinnati Reds. A fourteen-time All Star and ten-time Gold Glove winner, Bench hit .267 with 389 HR and 1,376 RBI. He led the NL in home runs in both 1970 and 1972, winning the MVP award each year. He helped the Reds win back-to-back World Series in 1975 and 1976. Where he is now: He is involved in various business and charity ventures, which can be found in his bio at JohnnyBench.com. He has also written three books about baseball, played in the Senior PGA Tour, and acted on stage (Joe Hardy in a Cincinnati production of Damn Yankees) and TV (played a military guard in a 1971 episode of Mission: Impossible). Google Autocomplete results: He is third when you type Johnny B, between Johnny B Goode and Johnny B Goode Lyrics, which refer to the Chuck Berry song. There do not appear to be any other prominent Johnny Benches. Coming up next: The next profile will be Bill Bene. 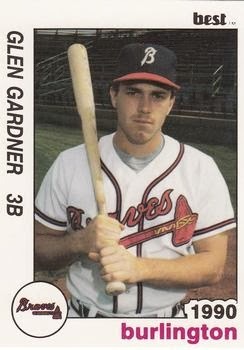 Infielder Glen Gardner played three seasons in the Braves organization. In 337 games he hit .287 with 24 HR, 183 RBI and 46 SB. Now the Director of Baseball Operations at Rutgers University, he kindly replied to my questions about baseball cards. "I was a lefty hitter….. on my 1990 Burlington Braves card I posed as a righty….. the photographer did not care." Scott has got a ton of 2005 Donruss cards to trade - let him know if you need any. Here is a nice card of new Yankee Brian Roberts in a throwback Orioles uniform. Speaking of uniforms, check out Angel Guzman's non-regulation white sneakers, in a photo apparently taken at the county fair. Cliff Lee's photo has something not often seen in a baseball card photo - lens flare. Perhaps the picture was taken by JJ Abrams? The photo itself was at least three years old when the set came out - you can see it in his 2002 Donruss Rookies card. What's with the weird photoshopping of the right side of the stadium on Joe Nathan's card? This is the card that actually kicked off the trade - a 1978 Yankees SSPC Championship Diary card of the late, great Paul Blair, the last one I needed to finish the set. It's kind of weird to see another Yankee wear #2. The first one I remember is Wayne Tolleson. Now of course it's known for Derek Jeter. I have 26 cards of Freddie Benavides. This one is from 1991 Fleer Update. Playing career: Infielder Freddie Benavides played for the Reds from 1991-1993 and the Expos in 1994. In 219 games he hit .253 with 4 HR and 52 RBI. Where he is now: Infield coach for the Cincinnati Reds. Google Autocomplete results: He is first when you type Freddie Bena, ahead of Jose Benavidez Freddie Roach, a boxing match. There do not appear to be any other prominent Freddie Benavideses. Coming up next: The next profile will be Johnny Bench. I have one card of Alvaro Benavides, from 1992 Classic Best. Playing career: Alvaro Benavides pitched three seasons in the Giants and Orioles organizations. In 107 games, all in relief, he went 7-13 with 4 saves and a 4.04 ERA. Where he is now: Anyone know where Alvaro Benavides is now? Google Autocomplete results: He is second when you type Alvaro B, between Alvaro Beamud Cortes, a photographer, and Alvaro Bulto, a Spanish TV personality. The first entry when you google Alvaro Benavides is not the ballplayer but a Venezuelan musician. Coming up next: The next profile will be Freddie Benavides. I have nineteen cards of Marvin Benard. This one is from 1997 Pinnacle. Playing career: Marvin Benard played nine seasons for the Giants. In 891 games, he hit .271 with 54 HR, 260 RBI and 105 SB. Interesting facts: Named in the Mitchell Report, he used steroids after a knee injury in 2002. Where he is now: A stay-at-home dad in Kennewick, WA. Google Autocomplete results: He is fifth when you type Marvin Ben, between Marvin Benson, an attorney in Vancouver, WA, and Marvin Ben-Aron, an attorney in Staten Island, NY. There do not appear to be any other prominent Marvin Benards. Coming up next: The next profile will be Alvaro Benavides. I have one card of Omar Beltre, from 2011 Topps Throwback. Playing career: Omar Beltre pitched in two games for the 2010 Rangers. Both were starts – he allowed a total of seven earned runs in seven innings. Interesting facts: He was banned from the US for five years after taking part (unknowingly) in a Dominican human trafficking ring. Beltre and several other players (including Alexi Ogando) were talked into sham marriages with women they had never met to get the women into the US, where, unbeknownst to the players, the women were sold into prostitution. Beltre and Ogando were later allowed into the US after they offered to travel around the Dominican Republic educating young ballplayers about the practice. Where he is now: Anyone know where Omar Beltre is now? Google Autocomplete results: He is sixth when you type Omar Be, between Omar Beats by Dre, referring to the company’s head of marketing, Omar Johnson, and Omer Beer, a Belgian drink. There do not appear to be any other prominent Omar Beltres. Coming up next: The next profile will be Marvin Benard. I have eleven cards of Esteban Beltre. This one is from 1992 Stadium Club. Playing career: Shortstop Esteban Beltre played five seasons in the major leagues for the White Sox, Rangers and Red Sox. In 186 games he hit .237 with 1 HR and 35 RBI. A fuller account of his career can be found at The Greatest 21 Days. Where he is now: He runs the Pirates’ Dominican academy. Google Autocompelte results: He is sixth when you type Esteban Be, between Esteban Bendersky, an MBA student at Columbia, and Esteban Benzecry, a composer. There do not appear to be any other prominent Esteban Beltres. Coming up next: The next profile will be Omar Beltre. I really like this picture of Pat Burrell surrounded by disembodied hands. The second from the right looks like you could draw a face on it and it would talk. This is my favorite card of the bunch. Great intense picture of Kirk Gibson. Outfielder Kevin Thompson played twelve seasons of professional baseball, including two years in the major leagues with the Yankees and A's. Now an Investment Specialist at Capital Financial Partners, he kindly answered my questions about baseball cards. "My favorite card is the one in Baltimore of myself. I was in the process of swinging. I no longer collect any cards." I have 45 cards of Adrian Beltre. This one is from 2000 Topps. Playing career: Third Baseman Adrian Beltre came up with the Dodgers as a nineteen-year-old in 1998, and was considered one of the best prospects in baseball. In his first decade or so as a major leaguer he was a very steady player, if not really a star, except for his one monster season of 2004, when he hit .334 with 48 HR and 121 RBI for the Dodgers. That was a contract year, and he signed for big money in Seattle, where hitters go to die (sorry, Robby Cano). After five years of solid but unspectacular play in Seattle, he went to Boston where he reestablished himself as a star in 2010. Where he is now: He signed with Texas before the 2011 season, and has had three of the best seasons of his career, putting up OPS numbers in the 130s each season. My memories: Five years ago I would never have thought of him as a potential Hall-of-Famers. If his career ended right now I don't think he would be - many good seasons but few great ones. He is only 34 - if he has a few more very good seasons than I think he is a borderline Hall-of-Famer. Of course, what I think of first for Beltre is that he never wants anyone to touch his head, which his teammates of course always try to do. Google Autocomplete results: He is tenth when you type Adrian, behind Adriano Goldschmied, a jeans designer. There do not appear to be any other prominent Adrian Beltre. Coming up next: The next profile will be Esteban Beltre. I have one card of Rigo Beltran, from 1992 Classic Best. Playing career: Rigo Beltran pitched in 78 games in five seasons for the Cardinals, Mets, Rockies and Expos. He went 2-3 with a 4.40 ERA. Where he is now: Pitching coach for the Lake County Captains of the Indians organization. Google Autocomplete results: He is second when you type Rigo B, between Rigo Brace, a scoliosis treatment, and Rigo Boxer, referring to Rigoberto Alvarez. Another prominent Rigo Beltran is the owner of Xtreme Concrete Solutions in California. Coming up next: The next profile will be Adrian Beltre. I have one card of Francis Beltran, from 2002 Donruss Rookies. Playing career: Francis Beltran pitched in 67 games in three seasons for the Cubs, Expos and Tigers. He went 3-2 with a 5.69 ERA. Where he is now: A pitching instructor at Xtremeline Baseball in Florida. Google Autocomplete results: He is third when you type Francis Bel, between Francis Belmont, an electrical engineer in Brazil, and Francis Bellamy Salute, the original salute used to accompany the Pledge of Allegiance. Another prominent Francis Beltran is an Operational Risk Manager at Ally Financial. Coming up next: The next profile will be Rigo Beltran. I have 61 cards of Carlos Beltran. This one is from 2001 Studio. Playing career: Outfielder Carlos Beltran has had a borderline-Hall of Fame career, hitting .283 with 358 HR and 308 SB in sixteen seasons with the Royals, Astros, Mets, Giants and Cardinals. The 1999 American League Rookie of the Year, he has won three Gold Glove awards and has driven in at least 100 runs in seven different seasons. He is also one of the best postseason hitters of all time (and certainly the best never to win a World Series), hitting .333 with 16 HR and 40 RBI in 219 at bats. Where he is now: He signed with the Yankees for 2014, possibly because he was unable to sell the Port Washington, Long Island mansion he built while with the Mets. My memories: I remember him tearing up the Cardinals in the 2005 NLCS, then striking out against the Cardinals to end the 2006 NLCS. He was considered a disappointment, probably somewhat unfairly, for the Mets. He became something of a folk hero this year as he finally made his first World Series appearance. Here’s hoping he has plenty left in the tank for the Yanks. Interesting facts: He created the Carlos Beltran BaseballAcademy, a high school and baseball academy in Puerto Rico. He is co-owner of Sofrito, a Puerto Rican restaurant in Manhattan. His cousin Reymond Fuentes made his major league debut for the Padres in 2013. Google Autocomplete results: He is first when you type Carl, ahead of Carl Icahn, a billionaire investor. There does not appear to be any other prominent Carlos Beltrans. Coming up next: The next profile will be Francis Beltran. I have six cards of Brandon Belt. This one is from 2012 Topps Chrome. Player profile: First baseman Brandon Belt came up with a lot of hype, making his major league debut as the Opening Day starting first baseman for the defending champion Giants in 2011. He struggled with injuries that year, but played a full season in 2012, helping the Giants to another world championship. Where he is now: Took another step closer to stardom with a solid 2013 season, hitting .289 with 17 HR and 67 RBI. He turns 26 in August, so he still has time to completely harvest his considerable potential. My memories: I remember him being hyped quite a bit, with him replacing someone (Aubrey Huff? Pat Burrell? Don’t remember now) from a World Champion team. Interesting facts: Has a blog with fellow Giant Brandon Crawford. The most recent posts are about their experiences as visitors in New York, which was interesting to read as a New York native. Google Autocomplete results: He is second when you type Brandon Be, between Brandon Beachy, pitcher for the Braves, and Brandon Beemer, a soap opera actor. There do not appear to be any other prominent Brandon Belts. Coming up next: The next profile will be Carlos Beltran. I got two 1977 Pepsi Discs in a contest win from Johnny's Trading Spot. Mike Hargrove and Butch Wynegar. I have a couple of other discs already but these are my first that are still attached to the packaging. On the back, you can send away for a shirt that says "To my Buddy, "Chris", Best Wishes, Pete Rose." Or Joe Morgan, Rico Carty or Rick Manning. I wonder how much a shirt would be worth today. I couldn't find any online, but here is a picture of a one, along with a Carty shirt, from a Pepsi wall display, from 4192cards.com. You could these shirts for "free" if you drank 240 bottles of Pepsi. Third baseman Tracy Woodson played five seasons in the major leagues for the Dodgers and Cardinals, winning a World Series ring in 1988. Now the Head Baseball Coach at the University of Richmond, he kindly answered my questions about baseball cards. "My 7 year old son and I have cards but I would not say we really collect them. There are times we go out and just get some every so often. I would not say I have a favorite but am very honored to have cards that represent me being in the big leagues. I believe they all show what hard work can get you. The one thing I tried to do was sign every autograph request I received for those cards. I still get cards sent to me today." Here are my winnings from a recent contest by Gavin of Baseball Card Breakdown, probably the most creative blogger out there. It's cool to get a bat card of a pretty big star. Adam Dunn is more of a Swing-and-a-Miss King, but he is in the top 40 all-time in career home runs. I also got three glow in the dark DefGav 1/1s. I see he has upgraded from altering junk wax to altering early-00's Fleer. Yogi Berra, Bill Skowron and Hank Bauer were Yankee teammates from 1954 to 1959. I have one card of Kevin Bellomo, from 1992 Classic Best. Playing career: Outfielder Kevin Bellomo spent three seasons in the Giants organization. In 183 games he hit .229 with 6 HR and 56 RBI. Where he is now: An American Legion baseball coach in Vermont. Google Autocomplete results: He is fourth when type Kevin Bello, between Kevin Bellows, a chiropractor in Connecticut, and Kevin Bello Medina, an engineering student in Peru. Another prominent Kevin Bellomo is Director, Corporate Applications & Enterprise Shared Services at Honeywell. Coming up next: The next profile will be Brandon Belt. I have one card of Rob Belloir, from 1978 Topps. Playing career: Shortstop Rob Belloir played for the Braves from 1975 to 1978. In 81 games he hit .216 with 0 HR and 13 RBI. Where he is now: Sports Information Director for the Savannah College of Art and Design. Google Autocomplete results: He is second when you type Rob Bello, between Rob Bellon, a motion graphic designer, and Rob Belloni, a Global Account Manager at Marriott International. There do not appear to be any other prominent Rob Belloirs. Coming up next: The next profile will be Kevin Bellomo. Outfielder David Krynzel played ten seasons of professional baseball, including two years in the major leagues with the Brewers. He kindly answered my questions about baseball cards. "I have one card that was taken right after BP, it has a picture of me with a tractor behind it.. not one of my favorites, but any card of mine is special. Especially the one of me at ogden.. I was 18, fresh as could be.. when I look at it, it reminds me of how much was in front of me, how much work i already put into baseball and how much work i had waiting for me to get to the top. Every year, every game every team every uniform every teammate every manager every fan meant so much to me. I breathed baseball, it was my life. Call it love for the game, yes... I had really fun times and really hard times, long hours on bus or plane, much much much more... it was all worth it.. the one play in the big leagues where I robbed a home run made a webgem top ten plays (#2) on a Friday night while playing in Milwaukee.. the play lasted approximately 7-11 seconds.. that play right there was worth every drop of sweat blood and tears it took me to get to the big leagues. Hard work and dedication." I have one card of Frank Bellino, from 1989 Best. Playing career: Outfielder Frank Bellino played six seasons in the Orioles and Phillies organizations. His best season was 1989, when he hit .285 with 10 HR and 77 RBI for Reading. Where he is now: Staff Photographer for the Riverside Press-Enterprise in California. Google Autocomplete results: He is second when you type Frank Belli, between Frank Bellina, prop master from TV shows ranging from Mork & Mindy to True Blood, and Frank Bellizzi, a religious blogger. Another prominent Frank Bellino is a racehorse owner. Coming up next: The next profile will be Rob Belloir. I have three cards of Clay Bellinger. This one is from 2001 Topps. Playing career: Utilityman Clay Bellinger played for the Yankees from 1999-2001 and the Angels in 2002. He played for four teams and all four won the pennant, with three of them winning the World Series. He played in two World Series with the Yankees. In 183 regular season games he hit .193 with 12 HR and 35 RBI. A fuller account of his career can be found at The Greatest 21 Days. My memories: Like most Yankee fans, I remember him fondly mostly because of when he played for them. Looking at his numbers I forgot how bad he actually was. Where he is now: He is a full-time firefighter for the Gilbert, AZ fire department. Other full-time members of the department are former major leaguer Andy Larkin (engineer) and Ila Borders (medic), one of the few women to play professional baseball. He is also an instructor at the AZ Baseball Boot Camp. Interesting facts: His son Cody Bellinger signed with the Dodgers in 2013 after being drafted in the fourth round. Google Autocomplete results: He is sixth when you type Clay Be, between Clay Beige, a Benjamin Moore paint color, and Clay Beads, a craft material. Another prominent Clay Bellinger was arrested for DWI in North Carolina in 2009. Coming up next: The next profile will be Frank Bellino. I have 18 cards of Ron Belliard. This one is from 2001 Topps. Playing career: Ron Belliard was a consistent but unspectacular second baseman for six teams over thirteen seasons, putting up seven seasons of 100+ OPS, though only once reaching higher than 107. He was an American League All Star with the Indians in 2004 and won a World Series ring with the Cardinals in 2006. My memories: As a Cardinal fan (my NL team) I remembered him fondly from the 2006 team. In 2011 he actually was with the Yankees for spring training but did not make the team and later retired. Interesting facts: In 2006, the married Belliard had a one-night-stand with a girl he met at a nightclub. The girl’s father later tried to extort money from Belliard, claiming that the girl was pregnant. The man, George Edwards, was sentenced to a year in prison. His cousin is former major leaguer Rafael Belliard. Where he is now: Anyone know where Ron Belliard is now? Google Autocomplete results: He is sixth when you type Ron Bel, between Ron Bello, President of NAV Enterprises, and Ron Belldegrun, a UPenn alumnus. Another prominent Ron Belliard is a Technical Support Manager at Crane. Coming up next: The next profile will be Clay Bellinger.